Inland Seas volunteers gathered around the square table at Inland Seas to talk about fish – despite the fact that there is no such thing as a fish. What follows is a list of interesting things that came up while discussing these interesting creatures. So how long does it take for a species to go from ‘invasive’ to ‘exotic’ to ‘native’? That depends on the specific example, apparently. We know that earthworms are an invasive species brought as ballast and as a farming aid. Some local foresters are concerned because earthworms turn over duff too quickly, so the ground doesn’t get naturally compacted with plant material. Because of this, you might say that earthworms are still invasive despite the fact that they’ve been here since the 18th century. Basically, a species is native unless it’s been introduced to the area. If it was placed there by humans and the overall effect is beneficial, it’s said to be an ‘introduced species’. If the effect has been negative, it’s considered to be an ‘invasive species’. Suggested further reading that challenges standard notions of invasive species: The New Wild: Why Invasive Species Will Be Nature’s Salvation, Fred Pierce. If you’ve been on Inland Seas in the past 5 years, you’ve probably talked about Round Gobies. They are the small soft-bodied fish that are causing big changes in the lakes. Round gobies are now being found as deep as 350 feet, and increasing their area of impact. This could mean even fewer darters and sculpins and a decline of diversity of forage fish overall. The gobies might be following a food source that they have a pre-established predator-prey relationship with: zebra and quagga mussels. In Lake Michigan, quagga mussels have replaced zebra mussels and one reason that they’re more successful is their ability to survive at greater depth. Inland Seas has discovered quagga mussels at depths of nearly 400 feet! So what’s going to happen to the goby? Scientists will say we have no idea, largely because conditions in the Great Lakes are changing so rapidly and surprisingly, and because it is their job to be cautious. 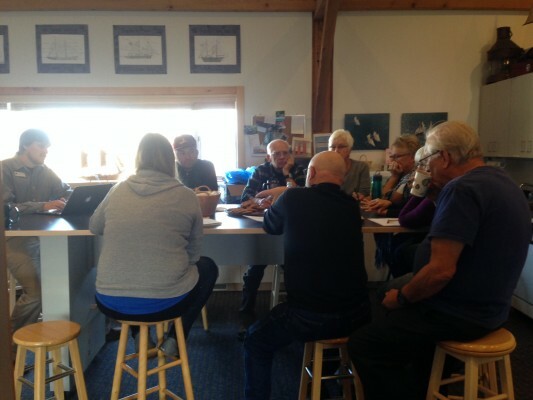 However those at the ISEA cafe this month have been watching the patterns in our fish catch for many years and have some ideas about what they think will happen. Our prediction is the goby will likely follow the exploding predator model which is a big initial boom with populations declining significantly after a few years due to equalization of the predator-prey relationship. There are still variations in their populations based on food, predators, and lots of other factors but it is unlikely that we will continue to see an increase in round goby numbers. The only way to find out is to keep watching in the years to come! Gobies have molar-shaped pharyngeal teeth – teeth that are located in the throat and attached to the gill arches. Once over 7 cm, round gobies are able to eat over 100 juvenile mussels per day. It is 100% legal to put gobies you caught back into the body of water they came from. There is no mandatory kill order from the DNR. Many sport fishers prefer to kill caught gobies to reduce the number of invasives in the lake. But given the incredible number of the fish, round gobies are now a permanent component of the Great Lakes ecosystem and killing a few will do nothing to impact their numbers. It’s illegal to store, transport, or use gobies as bait. This is because fishers usually transport their bait to their fishing site, and seldom transport it back to its original source. The law is made to reduce the spread of gobies to new locations. Is it true that when fish are young and bump their nose it ruins their river imprint? (their ability to travel back to that same river) We don’t really think so. Experiments with salmon have been able to steer them with magnetic fields, but we think the scent of the river plays a big role. There’s no evidence that a bumped nose impacts a fish’s ability to return to their spawning stream. What does it mean when a fish is missing it’s adipose fin? The adipose fin usually lies behind the dorsal fin on certain fish, most notably in the salmon family. If a fish is missing theirs altogether, it means that fish was bred in captivity and released by a fishery. Before they are released, a coded wire tag is embedded in the fish’s snout and their adipose fin is clipped off. If you have a fishing license, you should know what to do if you catch a fish without an adipose fin. Is it true that the local salmon populations are down? Yes, in a big way. Local salmon populations have been crashing and experts believe that it’s due to an inadequate supply of food. The next ISEA Cafe is December 8, at 2:00pm at Inland Seas. The topic is Plankton. Do you have a question about plankton? Do you know any interesting facts about plankton? What defines a plankton? Send questions/facts to Tom (tmaynard@schoolship.org) and attend the Cafe on December 8!